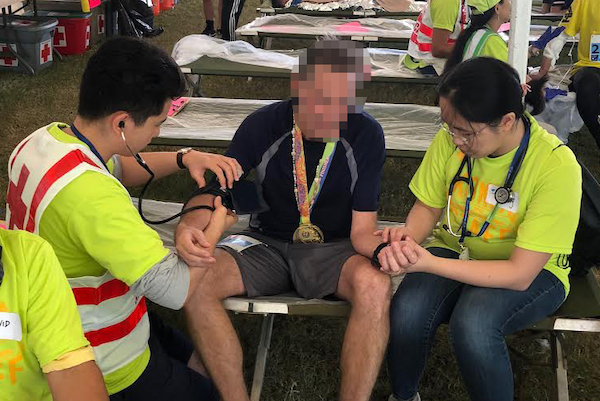 Pictured: Medical Students Jin Bae and Tiffany Lau tend to an ailing runner inside the medical tent at the 45th Honolulu Marathon on December 9, 2018. Photos by Dr. Katras. Enlightening. 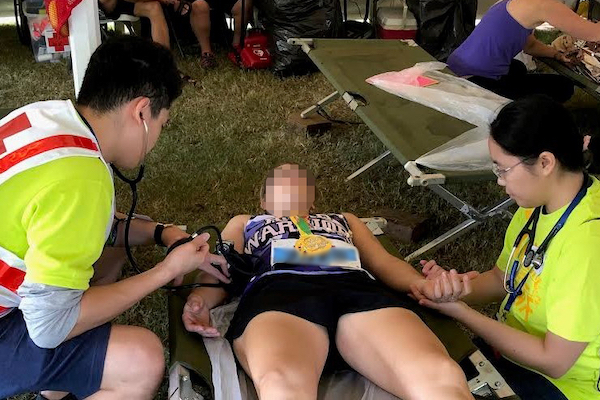 That is how second-year medical student Tiffany Lau described her duty helping the steady stream of patients who visited the first aid tent Sunday, December 9 during the 2018 Honolulu Marathon. Lau, of the University of Hawaiʻi (UH) medical school, served side-by-side with third-year medical student Jin Bae, both under the supervision of Dr. Tony Katras, UH John A. Burns School of Medicine (JABSOM) Clinical Associate Professor and Staff Vascular Surgeon at Straub Clinic and Hospital. Some 27,000 people from around the world signed up to take part in the Honolulu Marathon, which in its 45th year is the fourth largest in the United States. Dr. Katras said the students worked practically all day Sunday, from the early-morning start of the 26.2 mile race until late afternoon, in the Medical Tent at the finish line. Injuries the students encountered included dehydration, blisters, hypoglycemia, electrolyte abnormalities, and even three runners with heat stroke. “They did a fantastic job, seeing the usual running injuries of a Marathon – dehydration, blisters, hypoglycemia, electrolyte abnormalities, and even three runners with heat stroke (displaying body core temperatures of between 107 and 108 degrees! ),” said Dr. Katras. “The heat stroke runners were dazed, semi-unconscious, and in critical shape,” he added, helping explain the seriousness of the condition. The MD students and Dr. Katras even had a chance to chat about academic medicine with a fellow medical professor while serving under the tent. One of the runners turned out to be a medical school professor from the Vanderbilt University School of Medicine, there with his wife, a medical oncologist. Dr. Katras is one of more than 1,200 volunteer clinical professors who teach medical students and MD Residents trained at the University of Hawaiʻi medical school. This volunteer army of physicians far outnumbers our full-time, state compensated faculty. Without them, the John A. Burns School of Medicine simply could not produce new doctors for Hawaiʻi. Dr. Katras is a graduate of East Tennesee State University, its medical school and Baylor University, where he earned his fellowship in vascular surgery. He is a member of Hawaiʻi Health Partners, the state’s first Accountable Care Organization, whose participating physicians are committed to working together to provide high quality, efficient care to patients. He is affiliated with Straub, Kaiser Permanente and Tripler Army Medical Center in Hawaiʻi. In addition to serving as a volunteer clinical associate professor of surgery for UH-JABSOM, he is a UH-JABSOM clinical professor at the Tripler Army Medical Center, its Senior Vascular Surgery Consultant, and clinical professor and Director of Medical Student Surgery Clerkship for the Uniformed Services University of Health Sciences.